Mobile boards are for an on-the-go kind of life. 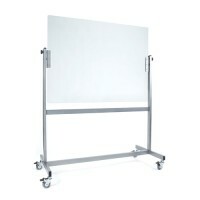 Boards with wheels or folding boards an collapsible stands make moving along easy. Free-standing boards require no commitment to placement and can be shared amongst locations. 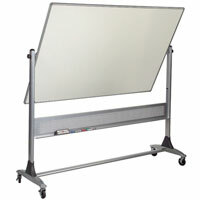 We offer markerboard mobile boards and mobile chalkboards. If you�re looking to mix it up, go for a half-cork, half-chalkboard, or half-whiteboard option. Keep your presentation options open with multiple surfaces. 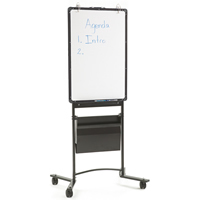 If you�re looking for a markerboard-only mobile board, consider a music-lined dry erase board side! There are glass boards, reversible boards, stationary boards, and projection boards to browse through! 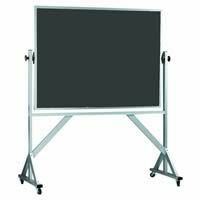 Reversible Chalkboards and Reversible Whiteboards lock into place for safety and convenience. Non-reversible, non-flip boards are steady too! Attach several boards with dividers or have a collaboration kit for a full presentation design! 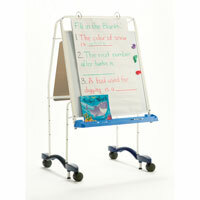 Easels for teachers and display easels with dry-erase board faces are great on-the-go helpers. Some easels double as teacher carts to carry extra items! If your board doesn�t have an accessory tray, be sure to grab one so you�re never without a marker or chalk at important moments!